For us DIY lovers and parents there’s nothing much better than building something for your kids to enjoy and use regularly. What’s even better? DIY projects that you can do with your kids help. Get your children involved and build something awesome together. 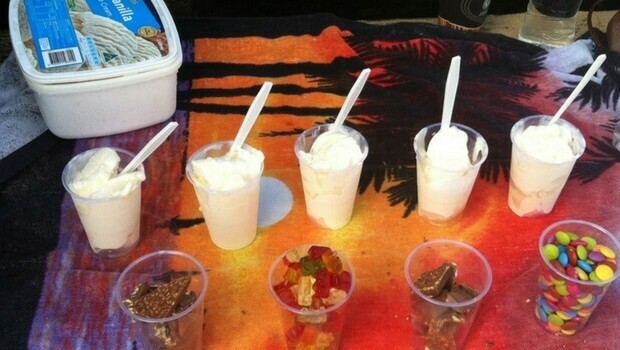 This is a project your kid is going to absolutely love. 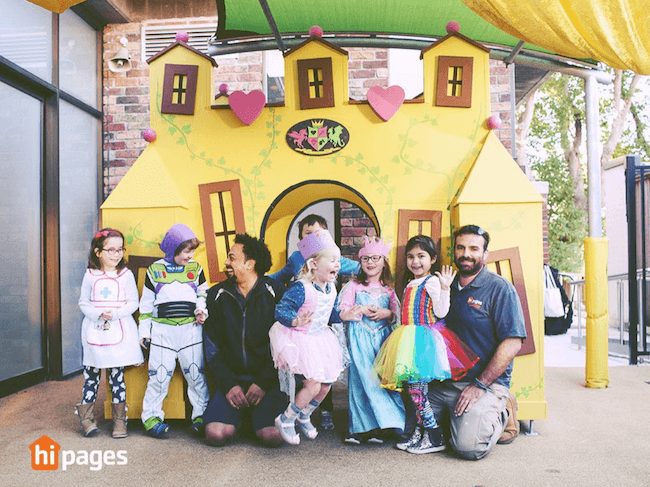 Sure they likely won’t be able to get too involved with the actual building of the cubby house but they can help you to design it, like in this volunteer built cubby house. Get your kids to sit down with some paper and pencils and have them design their dream cubby. You mightn’t be able to incorporate everything they’ve added but you can certainly compromise with them and create something truly special. At the very least, take them up on their paint colour scheme. You know those old boxy television cabinets that everyone has and no one knows what to do with? They can make the perfect play kitchen for your little girl or boy. Get the kids to plan out what their ideal kitchen should look like. Get them to pick out material for the curtains, tiles for the backsplash and what colour the cabinets should be painted. Paint the side door white to create a refrigerator and paint the bottom cabinets in the chosen color, leaving one door to become the oven. Above, create a stove top look with cut out paper. Create a faux window and attach some hooks to the side for the kids cooking utensils to hang. You’ll probably enjoy playing this one a little more with your kids after the DIY project is complete than the others. 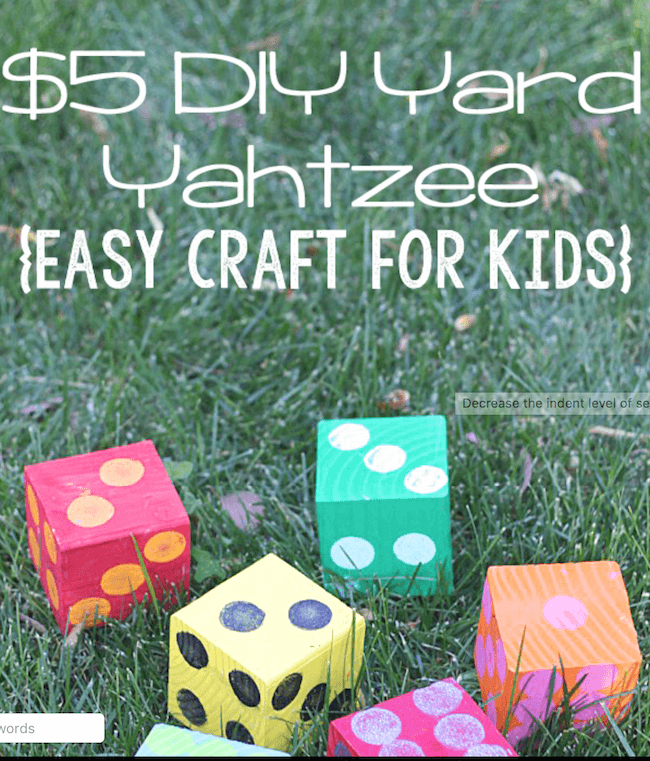 Yard Yahtzee is easy to make, the kids can join in and you can all play together afterwards. All you’ll need is a wooden 4×4, some craft paint, a round sponge brush and sealant. Create 6 wooden cubes by cutting the 4×4 down to size. With the kids, paint the cubes different colours and add the dots using the round sponge brush for the die numbers. Lastly, finish off with the sealant and let set. Create some score cards, or print out a set online and get playing! Nothing indulges a child’s imagination or ignites their reading habits quite like a tent. Play tents can be fairly easy and don’t require too many materials to make. First you’ll need to create the frame for the tent. This is the hardest step but it shouldn’t take very long so long as you have the right tools to work with. After the frame has been put together, you’ll need to secure it with some rope. The next step is the fun part. With some old drop cloth to use as your cover, get the kids to decorate it with some bright washable paint and different shaped sponges. Then simple attach the cover. Get the full tutorial here. ← Previous Story 10 Majungasaurus Facts Because We Want To Talk About Dinosaurs!